In Megalo Livadi, on the Greek island of Serifos, one finds the remnants of the first-ever Greek worker revolt. It took place in the mines of the Société des mines de Seriphos-Spiliazeza, the French-founded mining company later purchased and run by German Emilios Gromman. 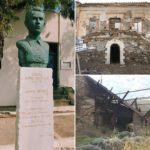 Angered by poor working conditions and intense labor without end, Egyptian-educated and Serifos-born Constantinos Speras sparked a revolt and held control of the island for several days. Eventually, troops were deployed from the nearby Kea island and the revolt was put down. But not before 4 workers were shot.